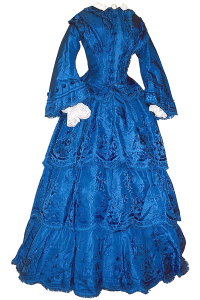 Jessie Blackwood wore this gown at her wedding to George Campbell on 10th July 1855 in Glasgow. They emigrated to Australia that same year and purchased a property in Cowra. 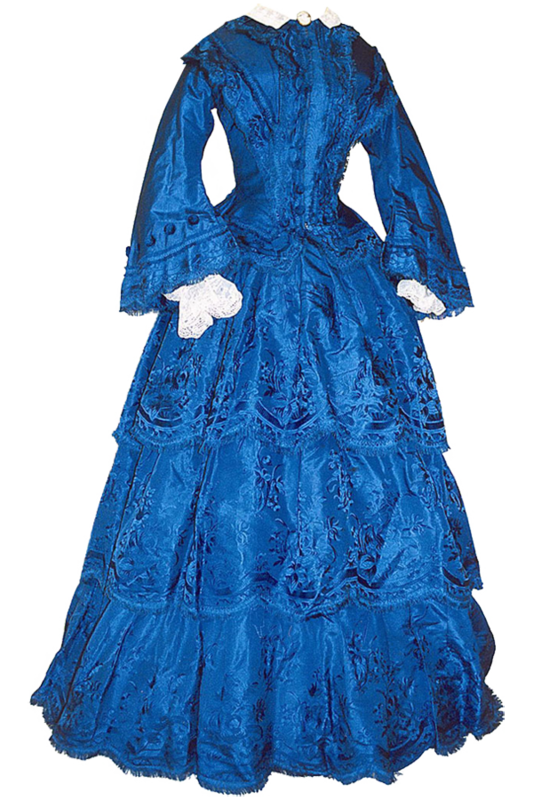 Coloured wedding gowns were popular in this era as they could be worn again. Skirts were wide and generally there were two bodices – one with a modest neckline and long sleeves for day and a more elaborate low-cut version with short sleeves for evening. The ‘day’ bodice is fastened at the front and has fashionable Pagoda sleeves which are narrow at the shoulder and widen toward the lower edge (wrist), to reflect the shape of the skirt. The sleeves were open at the cuff to reveal white under sleeves of lace or muslin, which were detachable. The skirt is in excess of 3.6 metres in circumference at the hem and consists of three tiers and is worn with many petticoats over a crinoline underskirt made of horse hair and linen. This heavy underskirt was replaced in 1856 by the cage crinoline which was made of hooped wires held together by sturdy fabric tapes. This greatly reduced the number of petticoats and the overall weight of the undergarments. The crinoline was all the rage for about 15 years. However, Queen Victoria reputedly exclaimed that ‘the crinoline is inelegant, expensive, hideous and, above all, dangerous!’.